“Adventure Time” is in that new category of animation on the cartoon network which I find confounding, albeit remarkably entertaining. It seems as though this is a straightforward kid’s show, but it gets remarkably close to being edgy enough for adults at moments. There is always a ripcord to pull, quickly pulling the narrative back to safety in time for the episode’s close, but watching this show with children present often makes me nervous. Perhaps this is partly due to the high octane, bizarre, and often psychedelic nature of the show which often makes me feel as though I’m on drugs. The story follows the adventures and misadventures of a human boy named Finn and his brother, a dog named Jake. Finn was adopted by Jake’s parents and they roam the magical land looking for adventures. Along the way they come across a number of regular characters, both good and evil. 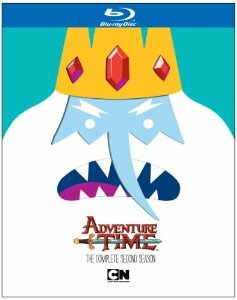 The villains include Marceline the vampire and the Ice King, and their main ally and adventure companion is Princess Bubblegum. 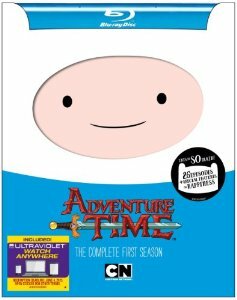 Both seasons one and two have been released on Blu-ray, providing a high definition presentation of the popular animated insanity. There is only the 2.0 audio track which was used from the DVD, and the special features remain the same from the DVD releases as well, but the picture has never looked sharper or more vibrant. Each season has 26 episodes, which are ten minutes long each. There are select commentary tracks on the season one episodes, and on all 26 of season two. Other features include interviews, featurettes and some behind-the-scenes footage of the actors and the animation.